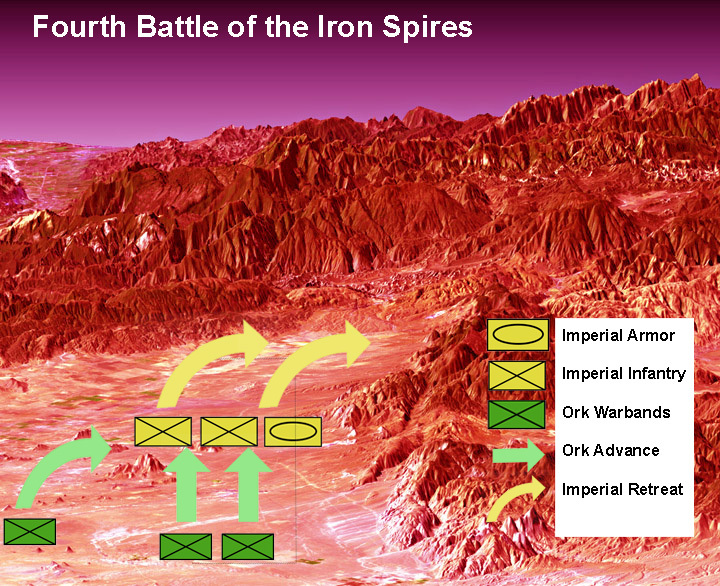 The Fourth Battle of the Iron Spires was fought over some of harshest terrain on Hegira, a region noted for fierce electrical storms and bitter cold weather conditions. “We interrupt our regular programming with the latest news from the Iron Spires. Our glorious Imperial forces are holding the line against the greenskin menace. There is no reason to panic. Irresponsible rumors that the battle is going poorly are groundless, and rumormongers will be severely punished. We now return to our regular programming.“—Public announcement, 3 010 736.M41. The ork commander is increasingly confident that the Imperial commander is paralyzed with indecision, and he acts in an unorky manner—obviously he’s one of those rare cunning greenskins. He leaves his one Trukk secure behind the butte on the Imperial left flank, a threat that he believes will quell any aggressiveness by Ceti Squad. In the center, he is happy to let his Tankbustas take potshots at the Imperial line, but moves his Shoota Boyz to the central objective, denying it to the Imperium. The Imperial Guard has waited too long to advance, the ork commander realizes. It’s unlikely the “humies” can now advance in time on the central objective—let alone wrestle it from a full mob of orks. But, just to intimidate the Imperial commander some more, he sends his Killa Kans and a large mob of Slugga Boyz to attack the Imperial right flank and threaten yet another objective. One Killa Kan is hit by auto-cannon fire but shrugs it off. 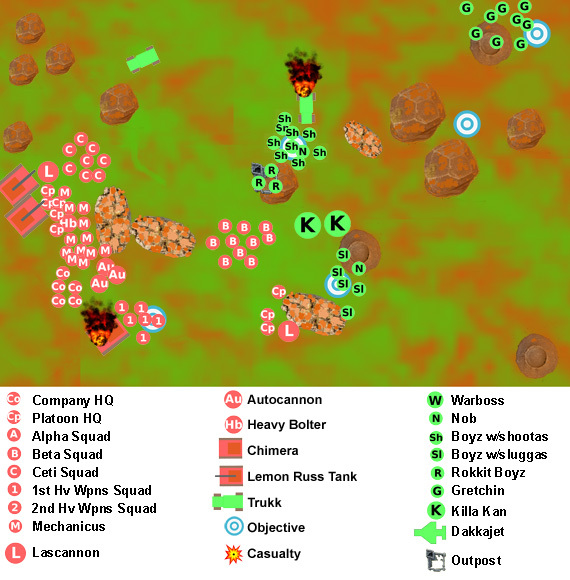 The Slugga Boyz subsequently charge 2nd Weapons Squad. Human flamers kill three orks, and a Snap Shot by a lasgun kills another. But the Guardsmen are overwhelmed by the bellowing and battle-frenzied ork survivors and are slaughtered to the last man. The Imperial Guard commander recognizes that he has been too timid, and he has waited to long to advance on the central objective. There is little he can do but advance Beta Squad forward, while the 1st Platoon command squad takes potshots at the orks celebrating their seizure of yet another objective. The ork commander is contemptuous of the “humies,” and he’s content to pick his nose and watch the sun set. When one of his Boyz complain that he wants to bash heads, the commander uses his choppa to bash in the head of the complainer. “There! Ya gotz your bashed ‘ead. Happy?” he says. The Imperial Guard commander also watches the setting sun. The battlefield is growing quiet, as the firing peters out. The orks are bellowing over their seized objectives, and the Imperial forces are demoralized and eager to withdraw. The commander gives the order reluctantly. Soon, he’ll have to face Commissar-Major Dracos and give his after-action briefing. He’ll be lucky if he’s just demoted for his poor showing; at worst, he’ll end up a commanding a penal battalion for his incompetence. Orks: 3 objectives x 3 v.p. each + First Blood (1 v.p.) = 10 v.p. Imperial Guard: 1 objective x 3 v.p. + Slay the Warlord (1 v.p.) = 4 v.p. TheGM threw out all his battle plans and allowed himself to be intimidated by the orks. He sat at his defensive line and sought to whittle down the orks at long range before advancing—but he didn’t have time for such a conservative and leisurely strategy. The Gaffer was unorky, but why wouldn’t he be? TheGM was giving him the battle, so he knew that charging forward and engaging the Imperial Guard would simply decimate his forces and give TheGM his once last chance at victory. So The Gaffer threw just enough orks at the Imperial troops to keep them quivering in their firing line—and waited it out. Click here to read Part 1 of this battle. Click here to read Part 2 of this battle. The Corvus Cluster is a hobby blog that chronicles our wargaming adventures in the Warhammer 40K universe of Games Workshop.